Patricia “Pat” Webster, age 87 of Spring Valley died Thursday July 5, 2018 at the Spring Valley Health and Rehabilitation Center. MEMORIAL SERVICE will be on Monday, July 9 at 11 am at Sacred Heart Catholic Church in Spring Valley with VISITATION from 9-11 am at church prior to the service. Memorials are preferred to the Alzheimer's Association. Pat was born September 11, 1930 to Alfred and Mary Weiss in Durand, Wisconsin. She attended Sacred Heart Catholic School-Lima, Durand, Wisconsin and graduated in 1948. After high school she worked at the local bank in Durand. During that time she played in the Weiss family band and met her future husband, Bernard ‘Bud’ Webster and were married October 4, 1954 at Holy Rosary Church-Lima, Durand. They purchased a dairy farm in El Paso Township, Pierce County, Wisconsin. In addition to raising their family, Pat helped Bud on the family farm. After Bud’s death in 1982, she went back to school and trained to become a Certified Nursing Assistant (CNA). 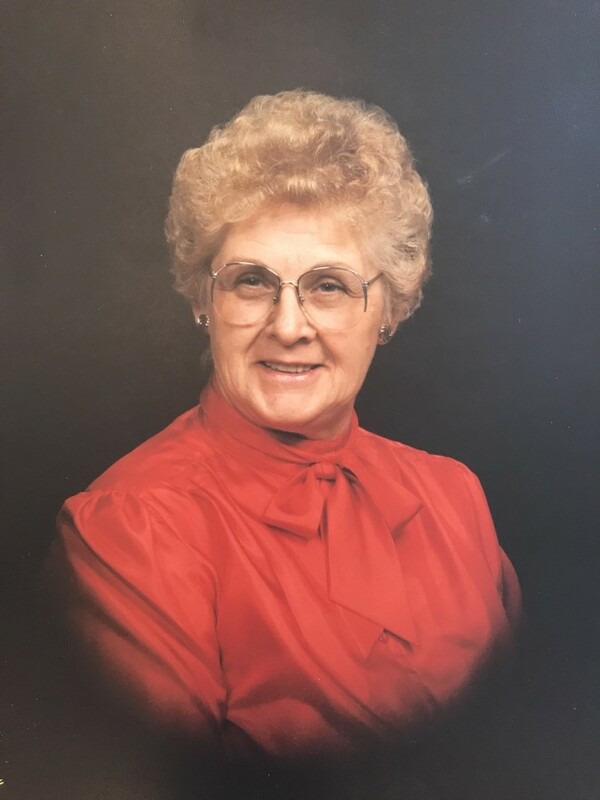 She was passionate about taking care of people and worked at the Elmwood and Spring Valley Nursing Homes and later did home health care until she retired. She was an active member of St Joseph’s Catholic Church in El Paso and Sacred Heart Catholic Church in Spring Valley. Music was a large part of Pat’s life. She played multiple instruments in the Weiss Family Band and later loved to sing in the Sacred Heart Church Choir and the Pierce County Ecumenical Choir. She and Bud loved to dance and were members of the local square dance club, Town and Country Twirlers. She also loved to garden, knit and make quilts and blankets for all the kids and grandkids. She enjoyed traveling and made several trips to include Hawaii, Austria, Japan, Israel, Switzerland and made a number of other trips. She is survived by: 6 children: Phyllis Webster of Maplewood; JoAnne Solum of Winona; Mike (Darcy) Webster of Elmwood; Larry Webster of Solon Springs; Kevin (Lori) Webster of Ellsworth; and Greg (Kristine) Webster of Viera, Florida; sister Carol (Jack) Komro of Durand; 28 grand and great grandchildren; many other relatives and friends. She was preceded in death by her parents; husband Bud; siblings: Mildred (Clarence) Pittman; Gene (Evelyn) Weiss; Aileen (William) Spindler; Alfred Jr ‘Fritz’ (Helen) Weiss; Donna (Ronald) Saiki; and Thelma Ableidinger; in-laws: Carol (Herman) Sukowatey; Dee (Ivan) Shafer; and Bob (Betty) Webster.